Maybe I should set the record straight right off the bat. It takes about five minutes to make this fudge but It will need to sit in the fridge or on the counter to harden for several hours. I just wanted to make sure that you knew that you were not going to bite down on a hardened piece of fudge in five minutes. 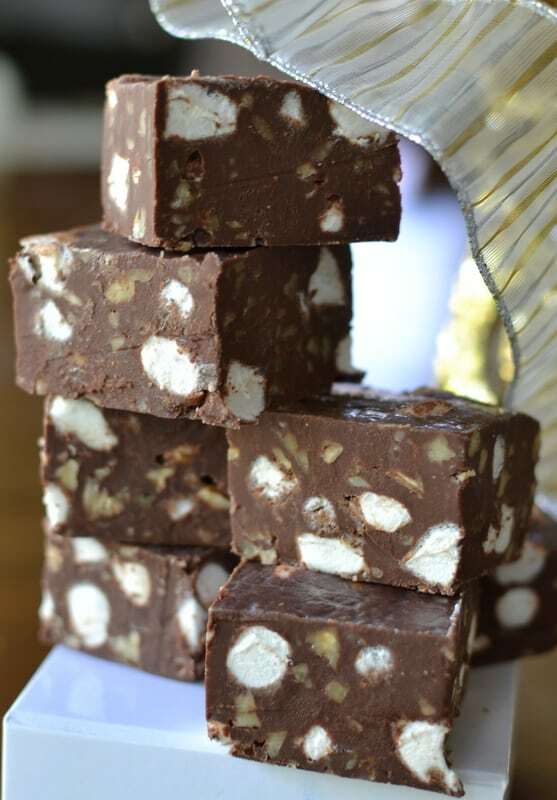 This delectable Five Minute Heavenly Hash Fudge could not be any easier. So if you want a foolproof fudge that does not require a candy thermometer and sets up every time than this is your baby! My Mom’s favorite candy was Heavenly Hash and when my Dad had time he would run by Famous Barr and pick her up a small white box of these delicious chocolate candies. Those were the days when department stores had a fresh candy counter. Now Dad would tell us that these were for Mom but she would sneak us pieces or we would sneak them ourselves. You know that heavenly hash candy is good when you are willing to risk a lashing for it. 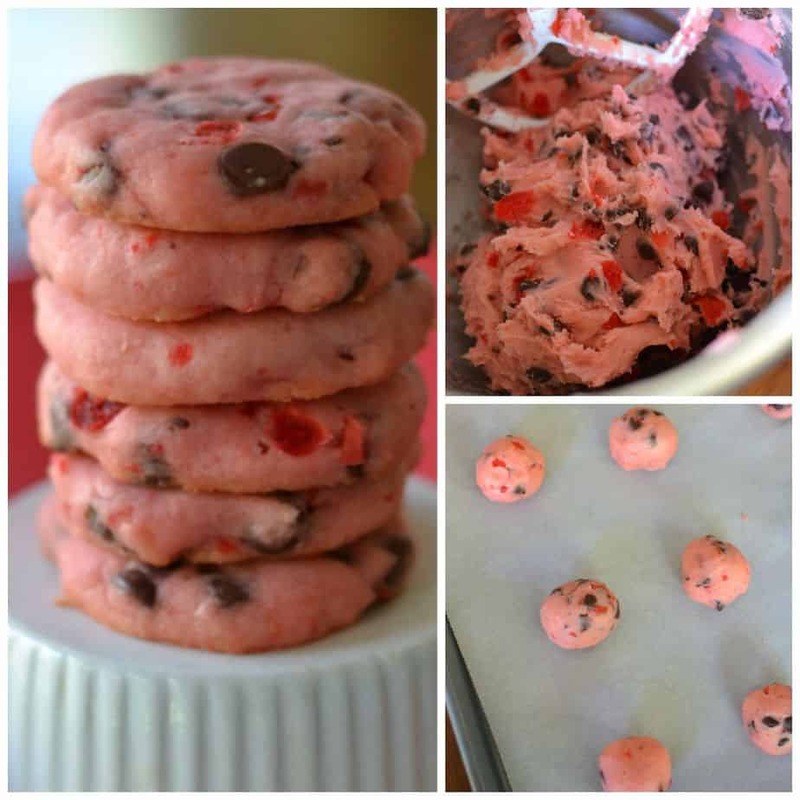 It is a perfect addition to your holiday party or cookie baking extravaganza. 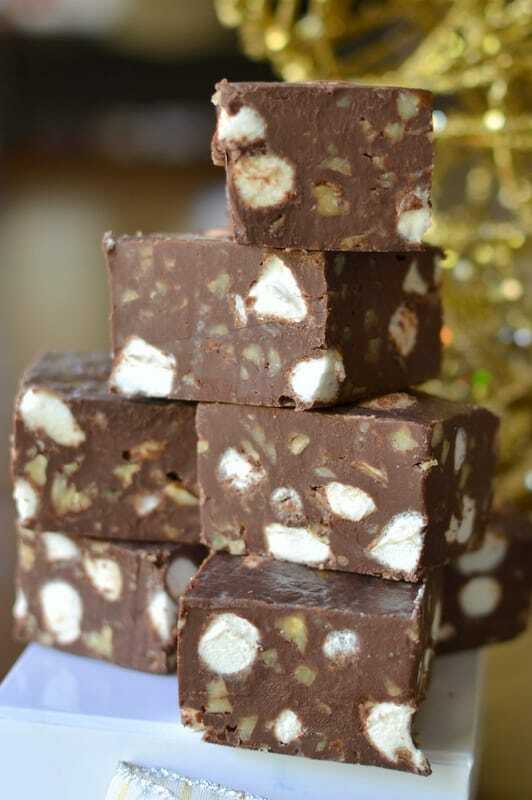 Fudge can be stored in the fridge for three to four weeks or frozen for up to three months. If placing in the freezer double or triple wrap to protect. Remember to remove from all packaging before defrosting so the condensation does not damage it. 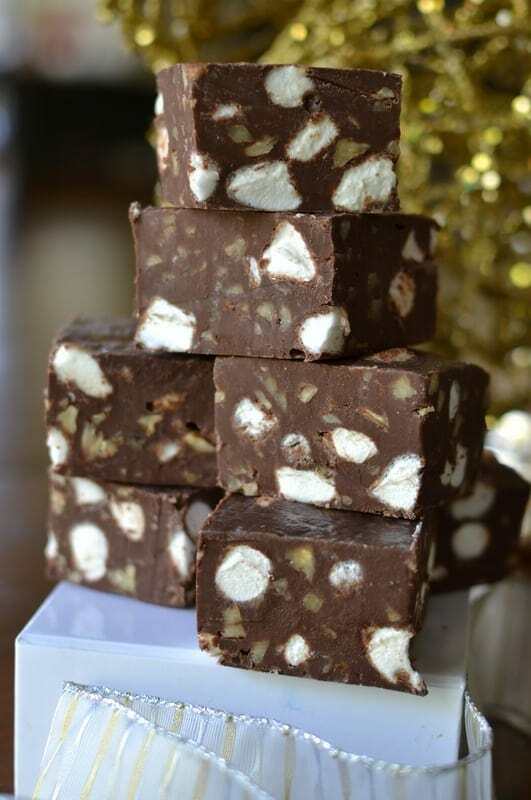 This gorgeous easy Five Minute Heavenly Hash Fudge brings chocolate, pecans and marshmallows together in perfect harmony. Have you tried my Foolproof Almond Joy Fudge, Strawberry Cream Truffles or my Chocolate Pecan Caramel Turtles? Hubby loves them all!! 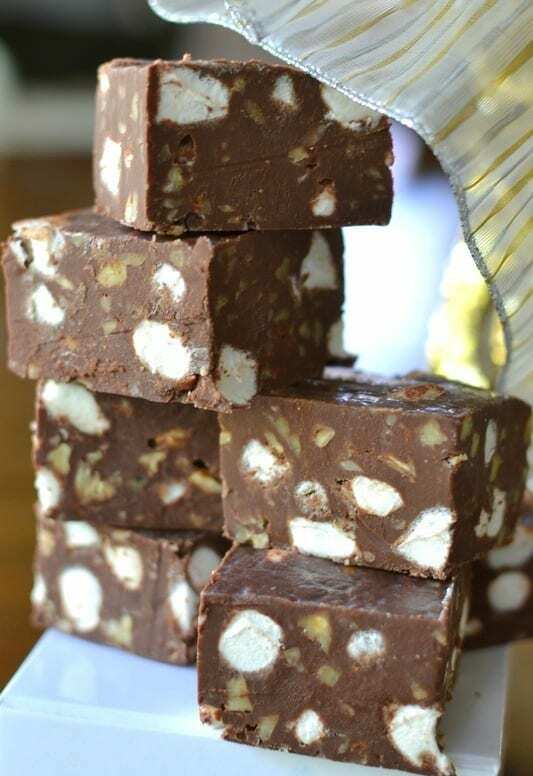 If your family is anything like mine they will love this Five Minute Heavenly Hash Fudge but be sure to inform them they are not going to be eating it in five minutes. Put this on your holiday list and your friends and family will be singing your praises. Line 8 x 8 inch pan with parchment paper leaving an overhang. You will use this overhang to help remove the fudge from the pan. 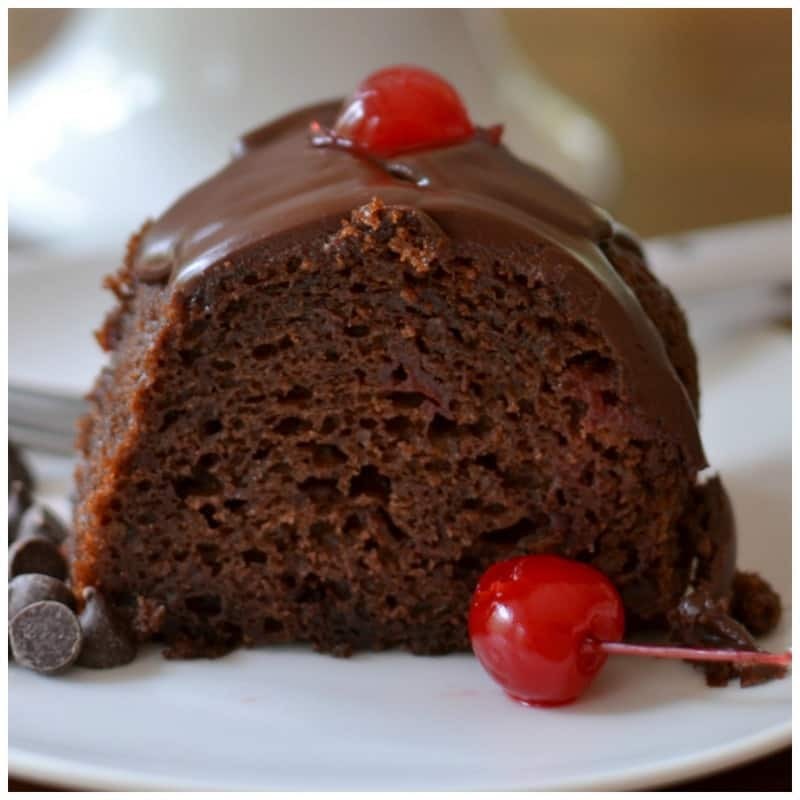 In large microwavable bowl add chocolate chips, sweetened condensed milk and butter. Cook in microwave at 50% power until chips are melted; approximately 3-5 minutes. Stir a couple of times during the cooking process. After chips are melted quickly stir in mini marshmallows and pecans. Pour into parchment lined pan and smooth with the back side of a spoon lightly sprayed with nonstick baking spray. Refrigerate until set. Using the overhang lift fudge out of pan and place on cutting board or plate. Peel off parchment paper and cut into bite size pieces. Other recipes you will love!! Both of those sound delicious but I do not have either one right now. I put the vanilla pound cake on my waiting list. Thanks for stopping by.